Open House Advent Concert: Come Celebrate with Us! As we put the finishing touches on our new home in the lower level of Knox College, we grow more and more eager to share it with you, our supporters. So, we are hosting an Open House and Concert on Saturday, December 1. The Open House will begin at 5:00pm and the Concert will begin at 7:30pm. In addition to welcoming you into our new home, the Open House will showcase the new and continuing educational initiatives ICS is currently pursuing. As the name implies, this portion of the evening will be open to everyone. If you want to hear about the latest work ICS is up to—or know someone who would like the chance to learn about what goes on at ICS—we'd be pleased to open our new space to you! The more the merrier! To wrap up the evening, we will also be hosting an Advent Concert that will feature choral music performed by the very talented Incontra Vocal Ensemble, and will be directed by the equally talented Matthew Otto. This will be a time of musical and Scriptural reflection in Knox College chapel. Because of limited seating in this splendid space, this portion of the evening will be a ticketed event, so purchase your tickets as soon as you can via the link above. If you have any additional questions, you may either call (416-979-2331, ext. 260) or email us (communications@icscanada.edu). We look forward to seeing you there! This May, ICS and The King's University will take an historic step in acting on their affiliation! Both institutions will be offering their first joint course available to be taken for credit by both graduate and undergraduate students. ICS President and Senior Member Ronald A. Kuipers and King's professor of philosophy and ICS alumnus Jeffrey Dudiak will co-lead the seminar and workshop, which will occur on-site in Toronto over the course of the week of May 23-31, 2019. 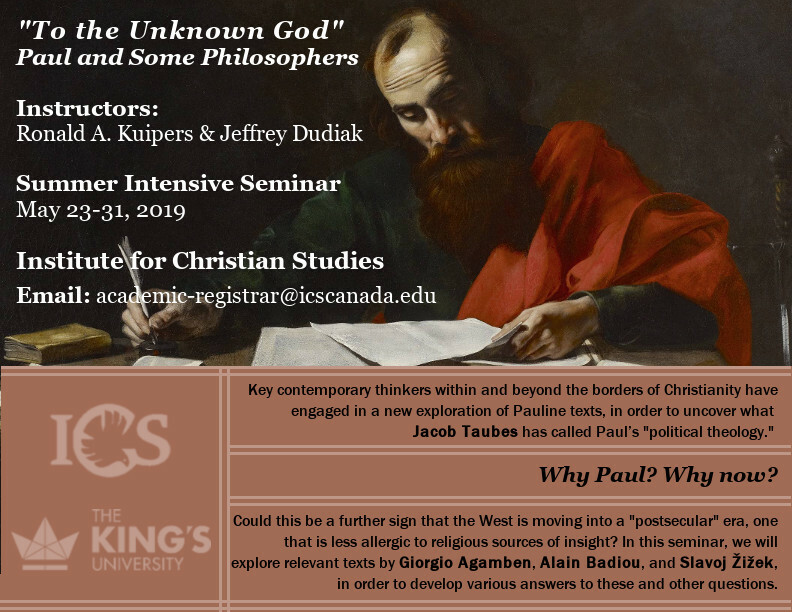 The course is titled "To the Unknown God": Paul and Some Philosophers, and will consist of two parts: participation in this year's ICS Undergraduate Workshop—a presentation-based workshop driven by close interaction with contributing students' research—and a week-long intensive seminar. Students have the option of either applying to the workshop apart from participation in the seminar, or enrolling in the seminar, which includes participation in the workshop. The workshop will allow undergraduate and graduate students to experience firsthand the kind of deep and careful attention to their ideas that is characteristic of both an ICS and King's approach to education. The intensive seminar around the current use of the thought of Paul in the realm of social and political philosophy will, in turn, allow them to engage deeply with current trends in the field and to make live connections to their own work, interests, and concerns. We eagerly anticipate making this joint opportunity a reality for both institutions in the coming months. If you or anyone you know would be interested in participating in the seminar, the workshop, or both, please contact our Registrar at academic-registrar@icscanada.edu.